A Guaranteed Stop order is one of the main trading orders that investors use when they spread bet, trade CFDs and/or trade the forex markets. The orders are used to help investors with their risk management. 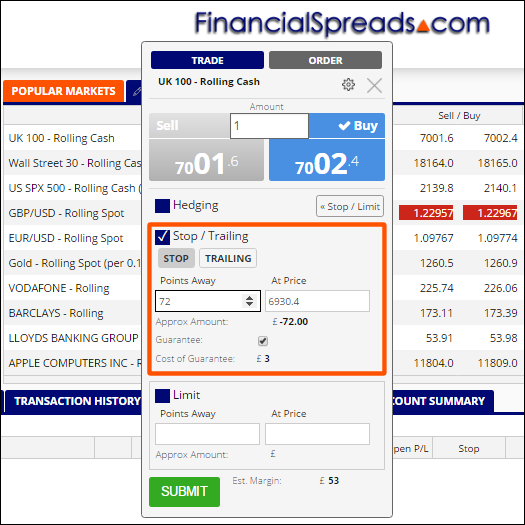 Financial Spreads has now reduced the cost of using this type of order in two important ways. Firstly, most spread betting, CFD and forex providers charge clients when clients add a Guaranteed Stop order to their trade, irrespective of whether the order is used or not. Financial Spreads now only charges investors if the Guaranteed Stop order is triggered. This means Financial Spreads clients are not charged for using Guaranteed Stops if they add and then remove the order, or if clients manually close their trade, or if their trades are closed because they hit a Take Profit (Limit) order. Secondly, while Guaranteed Stops are a form of insurance against market gaps, the company has also reduced the cost of using the order even if it is triggered. Financial Spreads now only charges clients a cost of 3 points on stock indices, crude oil markets or the main forex markets like EUR/USD, USD/JPY and EUR/GBP. According to Adam Jepsen, the founder of Financial Spreads, a key benefit of these improvements is the increased flexibility they give clients. "Investors should always bear in mind that spread betting, CFD trading and forex trading are high risk. With any investment it's important to recognise your downside. "Guaranteed Stops are a form of insurance and will limit your downside. "The great thing for clients about our new Guaranteed Stops is that they are a bit like only paying for your car insurance if you have had an accident. "By not charging clients for adding a Guaranteed Stop to their trade, clients have far more room for manoeuvre and lower trading costs. "Using a Guaranteed Stop would protect investors against a flash crash like we saw with GBP/USD on 7 October. However, a more common and realistic scenario is where a market might gap lower or higher over the weekend. "With the new changes it is easy for clients to add a Guaranteed Stop before the markets close for the weekend. If the order is triggered once the markets re-open then the client only pays a handful of points for protecting their downside. "If the order isn't used then the clients can easily choose to remove the order when the relevant market opens again on the Sunday or Monday. "When a client isn't using a Guaranteed Stop, they can then use a normal Stop Loss order to protect their downside and there is no charge even if the Stop Loss is triggered. "Clients should still be careful with Stop Loss orders though, these orders are not Guaranteed if a market gaps lower or higher from one price level to another. If the underlying market gaps, a normal Stop Loss will close an investor's position at the next level the market trades at". A Guaranteed Stop is designed to close a trade at the level set by the investors irrespective of any market gaps. Adam Jepsen also said that the new charges represent a large decrease in cost of using the Guaranteed Stops. "Our old Guaranteed Stop charges were fairly high but the new ones, like our tight spreads, are very competitive. We used to charge clients 10 points to add a Guaranteed Stop. "Now, apart from our South African Rand and Hungarian Forint markets where we still charge 10 points, we only charge 3 points on our forex, index and energies markets". To assist clients with their risk management, Financial Spreads automatically adds Stop Loss orders to all new opening trades although clients can opt-out of this facility. Once a Stop Loss has been added then, while the markets are open, clients can adjust the level of these orders and/or make them Guaranteed Stops. Guaranteed Stop charges on metals are 5 points, for UK and US shares there is a 0.30% charge and for European shares there is a 0.50% charge. Guaranteed Stop and Stop Loss orders are used by investors to protect their downside when they trade. If the market they are trading moves against their position and across the level of their Stop then the Stop order will close the trade and limit the investor's losses. There is no cost for using a Stop Loss order with Financial Spreads. However a Stop Loss order is subject to market 'gaps' (also known as 'gapping', 'slips' and 'slippage'). A gap is where a market jumps between price levels. This happens more often in volatile markets, illiquid markets and/or between opening and closing times. If a market gaps and doesn't trade at the level of a Stop Loss then the Stop Loss will close an investor's position at the next level the market trades at. Financial Spreads charge a small fee for this extra level of insurance. The Stop level allowed is typically further away from the opening trade. E.g. on a popular market like the UK 100, a Stop Loss can normally be set within 3-5 points of the opening trade. A Guaranteed Stop must be at least 1% away, so if the UK 100 is at 7,000 then a Guaranteed Stop must be set at least 70 points away from the level of the opening trade. For a worked example please see how Guaranteed Stop Loss orders work. The company offers tights spreads via www.financialspreads.com and their mobile apps. E.g. on popular markets like EUR/USD they offer a spread of 0.7pt. There is a spread of 0.8pt on the UK 100, USD/JPY and EUR/GBP.